The Standing Liberty quarter coin was struck by the United States Mint from 1916 to 1930. It succeeded the Barber quarter, which had been minted since 1892. Featuring the goddess of Liberty on one side and an eagle in flight on the other, the coin was designed by sculptor Hermon Atkins MacNeil. 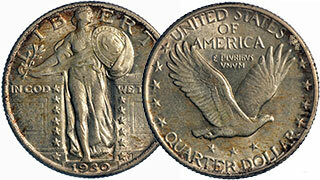 The Standing Liberty quarter coin was discontinued in 1931, a year in which no quarters were struck. By Congressional act, the Washington quarter, featuring the first president’s profile was introduced in 1932 to celebrate the bicentennial of his birth.